These rivals will see each other again, and in more meaningful games. But Daniel Boone has the upper hand early, beating David Crockett for the second time this season. This one came in the East Tennessee Classic softball championship in a 3-0 decision Saturday night at Winged Deer Park. Boone improved to 12-2 on the season while Crockett slipped to 7-3. Boone head coach Jeremy Jenkins said he liked the work of his pitchers throughout the tournament. In the title game, Nickolette Ferguson struck out 10 in a three-hitter. In the third-place game of the Gold Bracket, Unicoi County outlasted Science Hill by a score of 7-6. Knox Farragut defeated Dobyns-Bennett 4-0 to win the Silver Bracket. Sullivan South was the Bronze Bracket winner while Unaka earned the White Bracket title. McKenna Dietz put Boone ahead 1-0 with a solo homer over the left field fence. Jenkins said Dietz is a power hitter. “She can hit as good power-wise as anybody we’ve got,” he said. That score stood until the fifth inning when Dietz led off with a double. Bug Hubbard followed with a two-run blast to give the Lady Trailblazers a pair of insurance runs. Dietz was hitting seventh in the lineup and Hubbard eighth. 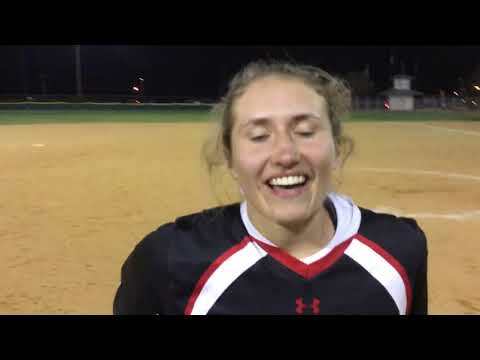 Jenna Davis took the loss, allowing four hits in five innings. Alyssa Suits led Crockett at the plate with two hits. With the score tied at 6-6 and the time limit approaching, Unicoi County’s Kiley Bennett delivered a one-out single to right field that played Betsabe Chavez with what turned out to be the winning run. The Lady Blue Devils scored in every inning, and were led at the plate by Allee Griffith’s 3-for-3, three-RBI performance. Griffith also hit a home run. Halie Hawkins added three hits and an RBI. Chavez and Ashtan Vance each totaled two hits as Unicoi improved to 8-2 on the season. For Science Hill, Sejal Neas homered and drove in two runs. Abagail Taylor, Jannon Glaspie and Zoey Cooper each had two hits. It was a tight one between the rivals, and the Lady Trailblazers were one run better. Boone took a 3-2 lead in the third inning and made it stand up. Camryn Sarvis had an RBI single to tie the game, and Megan Ackerman drove home a run with a groundout to put Boone ahead. Kasey Bennett had a homer and an RBI single to pace the Lady Hilltoppers (12-3). Matty McKee paced the Lady Pioneers with two hits and two RBIs as Crockett broke a 3-3 tie with a run in the fifth inning. Nicole Troutman led the Lady Rebels to the win. Troutman came through despite suffering a bad bruise on her leg after being hit with a line drive Thursday. A four-run fourth inning allowed the Lady Blue Devils to earn the come-from-behind win. Halie Hawkins and Samatha Chavez each had two hits while Ashtan Vance drove in a pair of runs. For D-B, Morgan Riffle had three hits, including a homer. Kassidy Miller also homered for the Lady Indians. Baylee Mesusan went 3 for 3 with three runs as the Lady Trailblazers rolled. McKenna Dietz added a homer and three RBIs. Nickolette Ferguson and Megan Ackerman combined in the circle to allow just one hit with six strikeouts in five innings. Jayden Salts had four hits to pace the Lady Hilltoppers. Jannon Glaspie and Kasey Bennett had two hits apiece. Zoey Cooper and Bree Presnell combined on a four-hitter. Riley Hope drove in three runs while teammate Ashley Dulaney added two hits and two RBIs. Kylee Wolfe added two RBIs for the Lady Patriots. Makaila Collier had two hits, including a homer, and three RBIs to pace the Lady Indians.